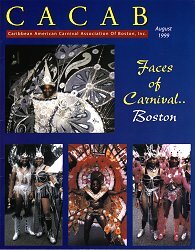 Five years ago, the Caribbean American Carnival Association of Boston, more familiarly known as Boston Carnival, produced its annual journal with content unlike that of any prior year, or since. The 1999 edition showed a broader range of cultural attributes indicative of the West Indian personality. Shawn Cedeno, Shirley Shillingford and staff of the eCaroh Caribbean Emporium, the editors, spent many hours preparing the work for printing. MassEnvelope provided design and printing services at highly discounted rates in support of this distinctive publication. On this fifth anniversary of the 1999 edition, we share a selection of some of the printed articles. The feature articles along with the 1999 Executive Committee and Advisory Board are shown below as the names appeared in print.